I somehow missed this piece of news, which was published almost along the same time as the ‘Vidhya Karajagi Fashion Show Fiasco’ (Read more about it here). Just as I was going through Hindustan Times’ archives, I found this clipping and trust me, for a moment, it seemed surreal. This cannot be happening! Not that I am not in favour of everything mentioned in this news report, it’s just that I find it really hard to believe that anyone in Army will take this seriously. Is it even practically possible? 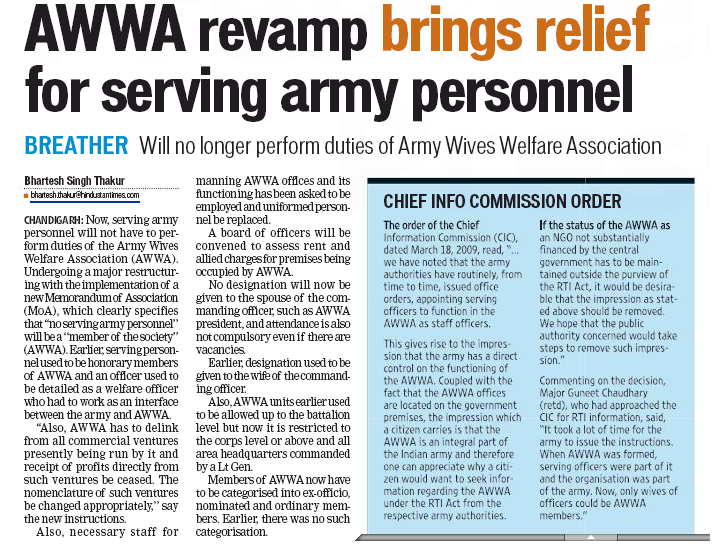 The report reeks of frustration faced by serving Army officers caught up with AWWA (Army Wives Welfare Association) activities, when they can be doing something more productive, something that we were recruited to do in the first place. I am curious! It has been more than one month since this report was published. Assuming this has been implemented immediately, I wonder how many officers have still been associated with AWWA work (voluntarily or otherwise). And only Army wives across India can tell us that. By the way dear Army wives, how well do you know AWWA, apart from its full form? What kind of things do you do under AWWA? AWWA (Army Wives Welfare Association) was formed after India fought (and won) the Kargil war against Pakistan in late 90s. It is supposed to be a platform for officers’ wives to help each other and soldiers’ wives in terms of moral support, or getting the widows help. There are AWWA shops all over the country where crafts and other small products made by these women are sold. And of course, at peace stations, almost every month there is a gathering of all the women in a particular military station where “fun activities and competitions’ are planned. Much like our FRG ( Family Readiness Group). It is usually run by both officers wives and NCO’s wives (non commissioned officers). When my husband in active duty service it was called something else but with the same idea. Each post does something different so it would not surprise me if there are craft fairs or other projects that I am not aware of. Most of the time money gong back into FRG and their projects. Thank you – that is what I thought. Which makes me wonder, do you have such an organisation in the US? Which kind of organization? Spouse clubs, or Family Readiness Groups? Yes, we have both, and I am active in both right now. What would you like to know? Well for starters, can you tell us what kind of activities these two groups conduct?